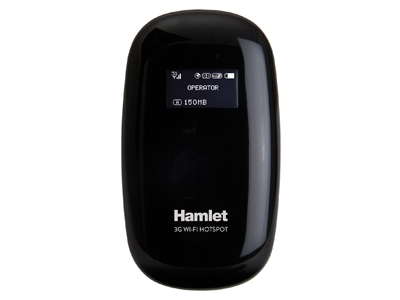 Hamlet 3G Wi-Fi Hotspot allows you to share the 3G Internet connection with up to 10 Wi-Fi devices at the same time. The 3G technology provides up to 21.6 Mbps downstream and 5.76 Mbps upstream data rates depending on reception and operator. Support for Micro SD card up to 32GB makes possible to share files between connected devices. * To use the router for internet connection, please remove the PIN code from the SIM card. ° Speeds will vary based on site conditions, 3G reception and operator.